Description/Historical Information: "A New Fire Brigade Era. Introduction of a Steam Fire Engine. A Perfect Success." 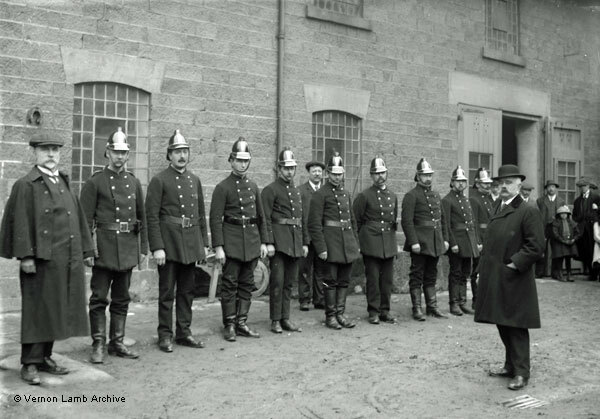 In this photograph are Matlock Fire Brigade, Captain John Nuttall (in the overcoat and bowler hat on the right) and Mr. Moss of the Company of Moss, Shand, Mason's of London (standing on the extreme left and wearing a cap). Matlock UDC had just purchased the Shand Mason fire engine from this well known company. It had been used for a time in London, but had been thoroughly overhauled and tested before it was delivered, and was guaranteed to be as good as new. The Council considered they had a good bargain as it would have cost £400 if new; they paid £200. The engine was a vertical steamer, capable of delivering 300 gallons of water per minute. The engine was constructed so steam could be raised from cold water in a time of 8 - 10 minutes from lighting the fire. In addition to Captain Nuttall the brigade included Firemen Platts, Reader, Dunn, Smith, Taylor, Flint, Vallance, Keeling and Froggatt. See, in the Uniforms - Non-Military section, VLA4981 | VLA4986. Also see, in the Events Matlock section, VLA4947 | VLA4967 | VLA5186 | VLA5192 | VLA5200 | VLA5218.